Someone here came to work with a 32GB flash drive that they purchased for the bargain price of R150. (Normally they cost around R400 at present). Needless to say, it does not work. Having bought it from the side of the road probably should have already indicated that this was not a good purchase, but apparently the Kingston-branded flash drive came in proper packaging etc. However, on opening it up, it turns out that there is no memory chip inside. 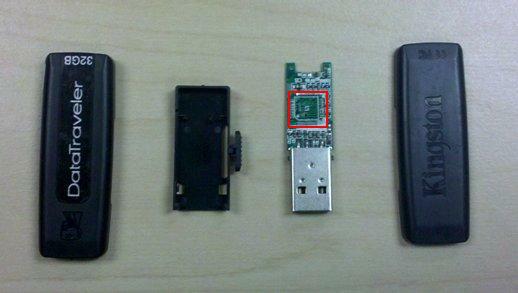 Exhibit A shows the internals of said bargain flash drive. The red square on the image highlights where the memory chip ought to have been. As the purchaser indicates, the R150 was “school money”, the lesson being that if it seems to be too good to be true, it probably is. This entry was posted on Thursday, January 27th, 2011 at 2:34 pm and is filed under General. You can follow any responses to this entry through the RSS 2.0 feed. You can leave a response, or trackback from your own site.